The primary responsibility of the Corporate Security Peace Officer Program (CSPOP) is to protect life and property, and to maintain the peace; to render aid to those in need of our service; to enforce the laws, rules and regulations equitably and fairly, regarding all persons. In July 2008, new uniformed peace officers joined the City of Edmonton's Corporate Security Law Branch. The Corporate Security Peace Officer Program consists of Peace Officers who provide enforcement of select provincial legislation and municipal bylaws. When required Peace Officers will assist the Edmonton Police Service as credible witness to any crime in progress providing safety and security to the general public, local business city staff and contracted employees. These officers are supported by Corporate Security Advisors. Peace Officers report to the Corporate Security Operations Manager, Mr. Kerry Nisbet. 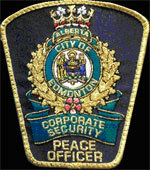 Corporate Security Peace Officers (CSPO) are responsible for the provisions of security service in the City of Edmonton facilities and property including the “Core Areas” such as City Hall, Sir Winston Churchill Square, Century Place, Chancery Hall, The Citadel Theater, The Winspear Center, Rice Howard Way and the Stanley A. Milner Library. CSPOP core functions are to patrol, monitor and respond within these “Core Areas”. Peace Officers provide bylaw and provincial legislation enforcement, security incident investigation, data and evidence management, analysis, reporting, consultation and advice on public education/communication. CSPOP mandate is to support the City of Edmonton through the protection of The City of Edmonton customers, employees, public and assets. CSPOP intend to promote crime prevention through high visibility and proactive patrol with collaborative relationships with the community. Work may be outdoors, on foot, exposed to all climate conditions, or indoors, in public building surroundings, working various shifts and weekends. Officers are subject to physical and mental stress in situations where exercising lawful force might be required, and must be consistently alert and exercise good judgment. Corporate Security Peace Officers maintain excellent customer service with a well trained professional staff. Peace Officers work in a cooperative environment with other law enforcement agencies to provide the best possible law enforcement outcomes for our community. What authority do the Corporate Security Peace Officers have in Edmonton? Corporate Security Peace Officers are sworn in by Alberta's Solicitor General and the Province of Alberta, giving them legal peace officer status. They have the authority to enforce certain city bylaws and specific provincial statutes The CSPOP mandate is to focus on particular issues affecting the “Core Areas” (as listed above). Special duty hours are available upon request, depending on the type of service required.